Alias is a secondary email address created from the primary email address with which you can send and receive emails. Each and every mail sent to the secondary email id will be received in the primary email account inbox. - According to oxford dictionary alias means “giving an additional equivalent name to an entity” which in general terms “a fake or assumed identity”. - The alias is a great invention for the one who don’t want to disclose his/her private email id in public. - Alias is like a subname or identity given to a person in the internet world. Its like you have different name for home and workplace. - Like I have my primary email address as priyanka****@xgenplus.com and I have created my secondary email account with the name sales@xgenplus.com and customersupport@datamail.in. - Now, all mails sent to alias email id sales@xgenplus.com OR customersupport@datamail.in will come in the inbox of primary email account priyanka****@xgenplus.com. How creating an alias email in XgenPlus is different from other email clients alias? Though major email clients like microsoft office, gmail, fast mail all have alias feature. But, what makes xgenplus differnt from other email clients is that you can send reply from the alias email id which is not possible with the popular email service provider. In XgenPlus alias email id’s can be created at user level whereas from other email clients alias feature is available at the admin level. Creation/ deletion of alias email id is very very easy in xgenplus. How to delete alias email id? 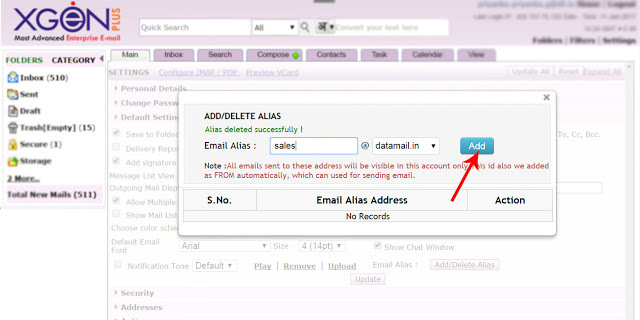 You can easily delete alias email id by just clicking on delete icon. This will cause any email sent to the alias to bounce, but will allow another user to create that alias in the future, unless you own the domain of the alias. Email sorting and managing emails – You might be quite surprised to know that alias can help you to sort mail and manage your inbox. Suppose you have an email address sales@yourdomain.com and enquiries@youraliasemail.com for new enquiries. Now , with the xgenplus advanced feature feature folder and filter you can sort your emails folder wise. This makes handling of emails more easier and convenient. Like I did for my all xgenplus sales inquiries. Subscribing newsletter is important to stay updated with the current market. Sometime newsletters are annoying when you have them in bulk in your inbox. That time will be the right time to use your alias email id and set filters to it so that the email will be send to the specific folder and you stay out of the chunks.